Features three unique modes of action to fight the visible signs of aging, enhance your facial appearance, and accelerate the benefits of your Osmotics cosmeceutical products. 2-LED Red, Blue and Green Light. 3-ION and ION-. Plus deluxe minis of our Blue Copper 5 PRIME Sleep Tight Mask and Cooling Moisture Mist; both work together with this breakthrough beauty tool to give you visible improvements in only 4 - 6 weeks! Experience the joy and confidence of radiant, ageless, more beautiful skin, now and for years to come! Use on clean skin. Apply appropriate Osmotics skin care product/products. IMPORTANT: when using ultrasonic and ionic modes, you must use water based topical skin care and/or facial mist to keep skin moistened as you move unit over skin. 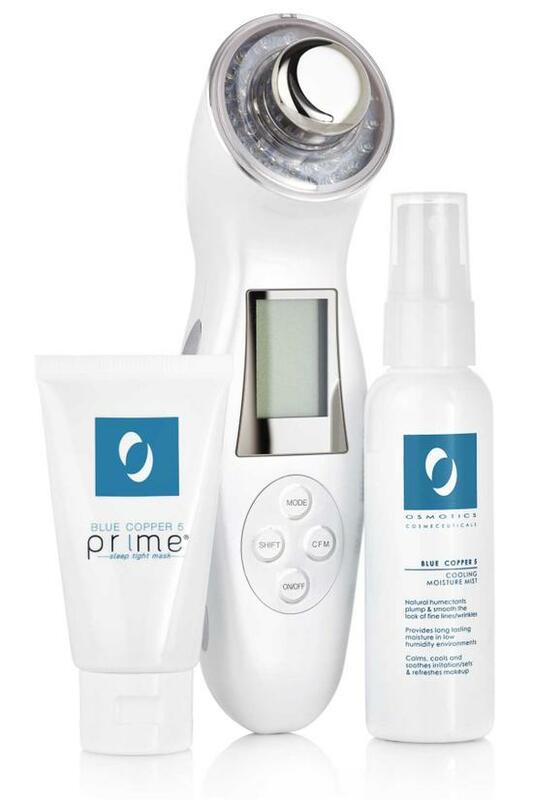 We have included the Blue Copper 5 PRIME Sleep tight mask and Cooling Moisture Mist that can be used by all skin types and with all three modes. Connect the plug into the adaptor cord and connect adaptor cord into unit. Now plug into power outlet to charge. After 90 minutes the unit will be completely charged; the charge will last for 120 minutes of continuous use without being plugged into outlet. Press the On/Off button: you will hear a beep and the lighted display will show functions and use time (from 1 19 minutes). You will see 4 buttons: On/Off, MODE (to select Sonic, Ion+ or Ion-, Photon, or Time) SHIFT (to select intensity or time) and CFM to start. Each mode or function can be used separately, one at a time, two at time or all three simultaneously (except Ion+ and Ion- which cannot be used at the same time).To Begin your session press the MODE button to select the function you want to use. When the function you want flashes, press SHIFT to adjust the intensity. (Begin with lower intensity and gradually increase to higher intensity). Then press the MODE button again to move on to each function you wish to use during your session; continue to select the intensity for each with the SHIFT button. When you reach the TIME MODE, press the SHIFT button to select the amount of time for your session. Now press the CFM (confirm) button to start your session. The unit will turn off automatically after 15 minutes. Care and Safety Do not immerse in water; store away from humidity. Use only the adapter provided for charging. Turn off power and unplug cable when not in use. Use a soft cloth to clean unit. DO NOT use water, chemical cleanser or detergent. Keep product away from children. Precautions Use goggles when using LED/photon mode. Do not look directly at the LED/photon light while in use. Do not use unit directly on eye or eyelid. Do not use while pregnant. Do not use with heat generating product. Avoid neck area if you have a thyroid condition. Do not use on severe cystic acne, open wounds or lesions. If you are taking medication that may increase photosensitivity, consult with your physician before use. Should you experience mild redness after use, this is normal and temporary. In the unlikely event redness persists discontinue use. Allergy Test - as with any skin care product, if you are sensitive, apply a small amount of product to clean inner forearm and let dry If after 48 hours no reaction appears you can enjoy using the products regularly.